One of the most important details to consider when designing a space is the type of hardwood flooring. Hardwood floors can either be installed as a prefinished product like engineered hardwoods, or finished on site like solid hardwoods. 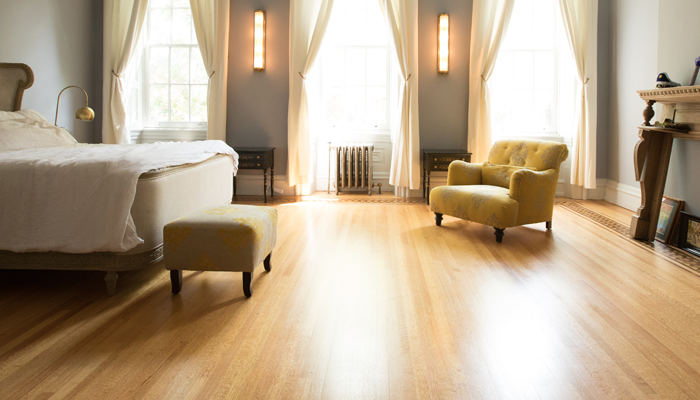 The natural beauty and durability of hardwood floors make them a great choice to enhance the design of any room. They are a timeless feature that can be fully customized from color, texture, pattern, finish, and width. There are nearly endless possibilities of hardwood flooring options to create the perfect aesthetic in your space. What works best in your home will be determined by lifestyle needs and the functionality of the room. One of the most important details to consider when designing a space is the type of hardwood flooring. Hardwood floors can either be installed as a prefinished product like engineered hardwoods or finished on site like solid hardwoods. Prefinished Flooring is a type of hardwood flooring that has had its finish applied at the manufacturing facility. Long before these materials arrive on a job site they have already been completely sanded and sealed. The installation process is much faster than unfinished floors and prefinished floors can be walked on right away. Because everything is finished at the manufacturer, there are no VOC’s or dust from sanding emitted into your home during installation and it is not necessary to vacate the house. They are available in a variety of options and include warranties that protect from defects in the finish and the stain. One thing to keep in mind is that prefinished floors are not recommended for high moisture areas like kitchens and bathrooms. Since there can be unfinished spaces between the floorboards, moisture and spills can easily penetrate through these areas. Unfinished hardwood flooring is the traditional way hardwoods have been installed until the recent development of prefinished flooring. They come from the distributor or mill as raw wood planks and are sanded and sealed on site after installation. 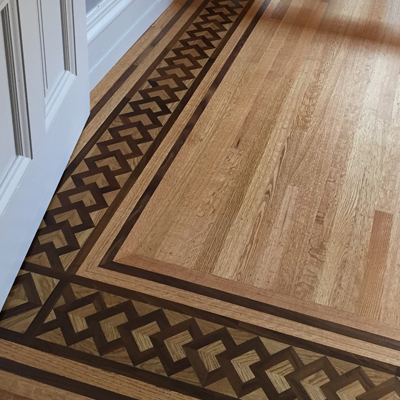 This is a great flooring option if you want a completely customized look, there are nearly endless options for combining characteristics such as wood species, stain colors, and finish types. It is also the best method to match or replace sections of existing floors. 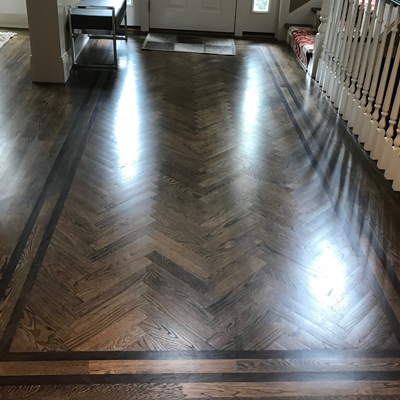 The installation of unfinished hardwoods does take longer, often residents will need to vacate the home due to processes of sanding, staining, and applying the finish. The application of each product is completed in phases to ensure proper curing for the most durable floor. When the finish is applied on site, the hardwoods also become sealed between the cracks creating effective moisture protection for areas such as kitchens. solid hardwood floors are solid pieces of wood that can have thicknesses ranging from ¾”to 5/16”. 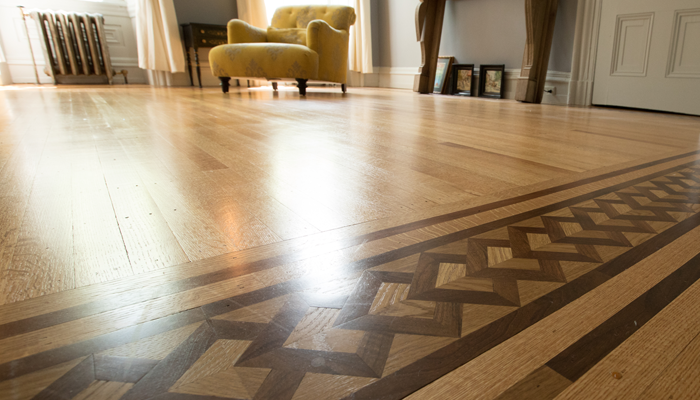 Solid hardwoods can be sanded and refinished many times throughout their lifespan, often lasting for decades. They are not recommended for below grade areas such as basements due to high changes in humidity and moisture levels that can easily warp the floor. 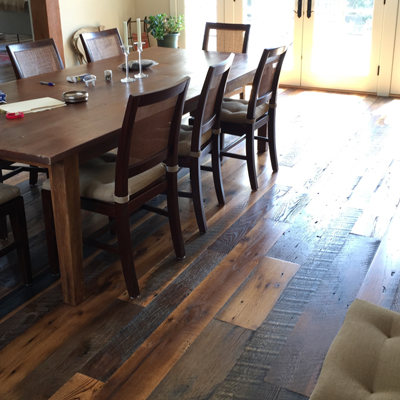 Solid wood floors are also susceptible to expanding and contracting even when installed at above or on grade elevations due to extreme humidity swings or not properly acclimating the floorboards to the site before installation. There are many solid hardwood species to choose from with a range of colors and grain patterns. Some of the most durable and common options are oak, maple, walnut, and hickory. Engineered hardwood floors come prefinished and are made from real wood but structured as multiple layers of wood or composite veneers. A composite veneer is made from materials such as compressed wood, resin, and polymers. 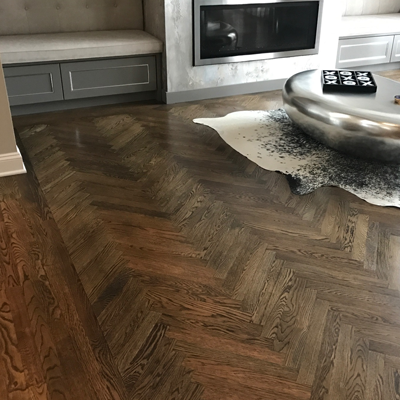 Engineered floors made from layers of wood can be all the same species or different species of wood, alternating the grain pattern in each layer adds strength and stability to the product. The layer of hardwood on top can sometimes be sanded and refinished down the road depending on its thickness. 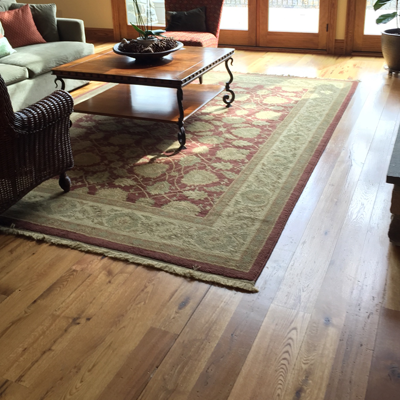 The layers in engineered hardwoods are very durable and make them resistant to expanding and contracting. They are not prone to damages from temperature and humidity which makes them suitable for below grade applications.